This little gremlin dude (who might actually be a dog of sorts – I can’t tell) was spotted in the park area that stretches between Lesnes Abbey and Southmere Lake. It’s not clear who owns what – did the same artist create it all? Or was the hangman’s noose a later addition to the picture? What about the rose? The mysterious Lolly seems to own those, was that already painted and the gremlin came to join it? I’ve no idea. And this one’s lacking text to contextualise the imagery. Next up, we have one with the familiar “icon” namestamp that the gremlin is lacking. 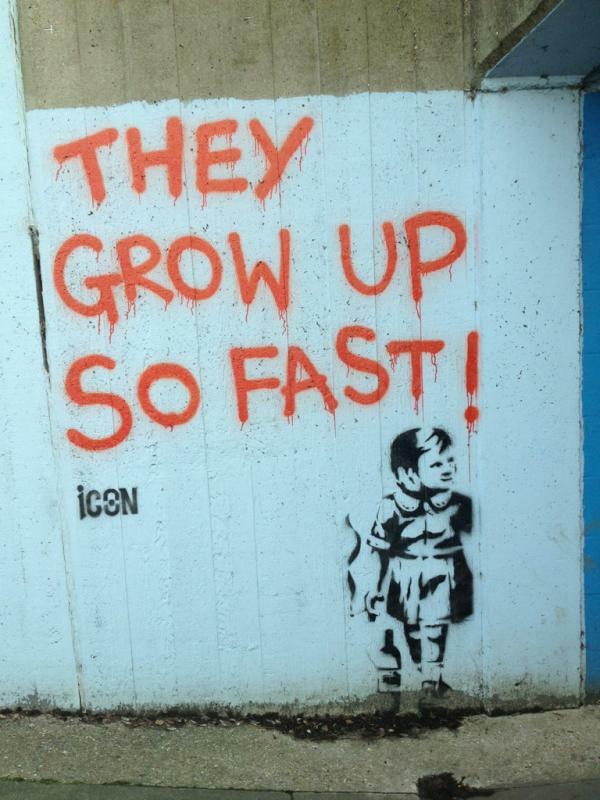 Again, the familiar red text sits alongside a black stencil, this time being an ironic picture of a little girl, innocent looking, but nonchelantly holding a cigarette which has a large plume of smoke emerging from it. “They grow up so fast!” the words say, as the girl peers off into the middle distance. This one was collected by @missy_t_k as well, so I’m not sure exactly where it was located. This next one has the “icon” stamp as well, and it’s a new take on the first piece I spotted. The same runner stands crouched on a starting block, ready to run, but this time he has little parachutists floating down in the background, and a comedy bomb at his feet. What I like about this one is that it might actually get to stay. I had to shift the bins to get the photograph, and I’m not sure whether the wall started out white and had the graffiti added, or whether the artist had to create his backdrop. The latter seems likely as there are remnants of standard tag marks showing behind it. 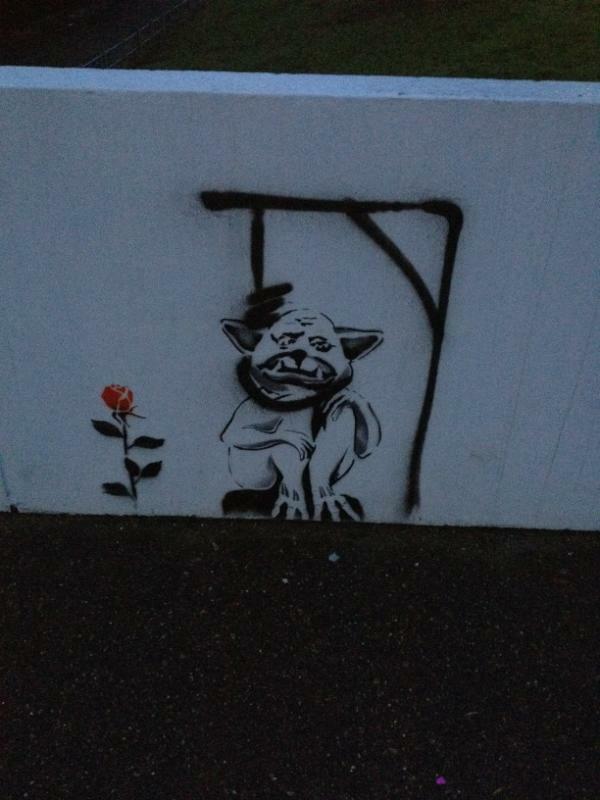 But surrounding this, in the small park area just south of Yarnton Way, there are all kinds of bits of community art that is clearly legitimate. It fits in pretty well, so perhaps it won’t be painted over. 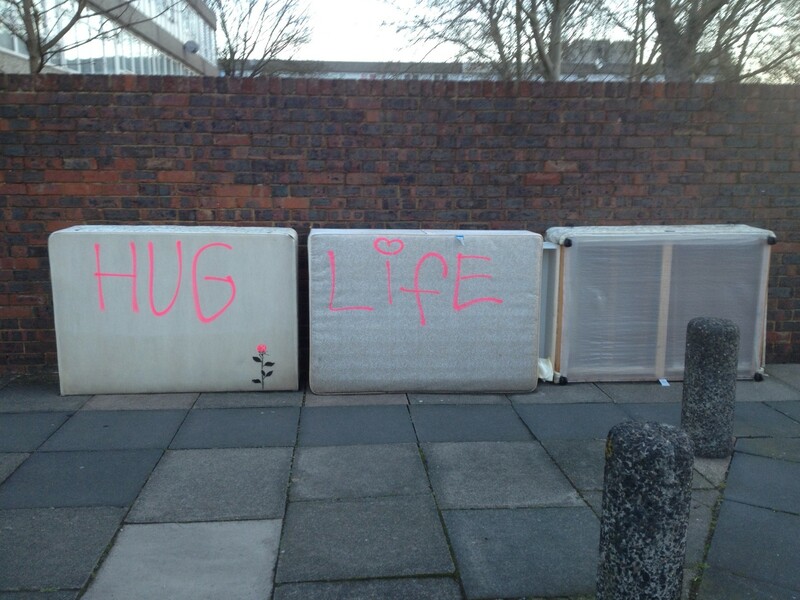 Fly tipping isn’t especially unusual. I’ve never worked out whether the furniture left outside is mostly reclaimed, or actually carried off by the council or Gallions. It’s never there for long, though, but in the meantime it’s not particularly attractive. It looks like lolly decided to brighten things up this morning, and the abandoned bed base shouts out in big bright pink letters “hug life” alonside the signature rose. Interestingly, it seems the artist has been a little further afield and the local paper has reported on a piece that appeared in the local B&Q. 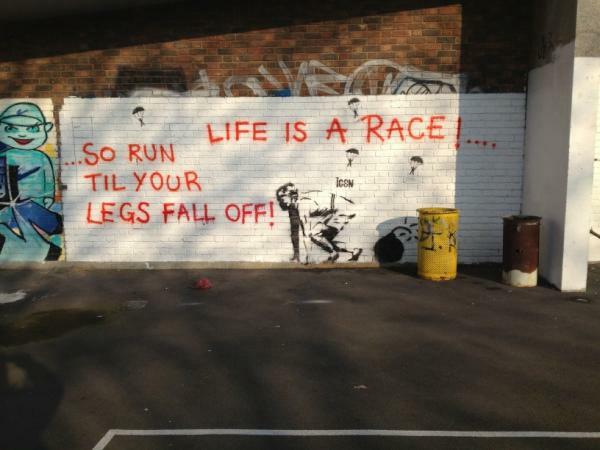 They’re jumping to the “Banksy” conclusion, and the comments show a range of opinions. This entry was posted in about the area and tagged art, creativity, graffiti, recycling. Bookmark the permalink.